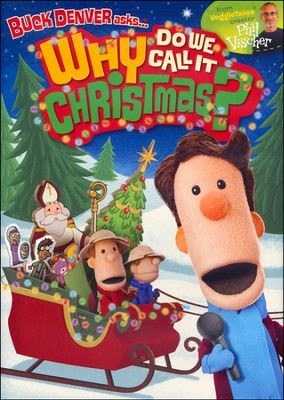 DVD Review & Giveaway: Buck Denver asks...Why Do We Call It Christmas? Title: Buck Denver asks...Why Do We Call It Christmas? You’re invited to the Party of the year…an educational, informational, Christmical kind-of party! Join VeggieTales and What’s in the Bible? creator Phil Vischer and his friends from the popular What’s in the Bible? series Buck Denver, Captain Pete, Sunday School Lady, Clive and Ian for the most unusual Christmas party ever! We know Christmas is one of everyone’s favorite holidays. But have you ever wondered why we celebrate the birth of Jesus by chopping down trees and putting them in our houses? Or why we hang stockings by the fire? Or how Santa Claus became such a big part of Jesus’ birthday party? And why do we even call it “Christmas,” anyway? You’ve probably heard the Christmas story - but have you ever heard the story of Christmas? • How does the name “Emmanuel” explain the real meaning of Chrsitmas? Yay, Christmas is coming! You have no idea how much I love this season! The lights, the carols, the tree, the time with family, it's all a lot of fun. However, with all of the traditional fun, as my littles gets older, she starts asking a lot more questions as to why we do certain things. And they are all good questions. Some I knew the general idea, but others, I had to go look it up. I've been eying the Buck Denver series for sometime, so when the chance to review this DVD came up, I thought I would give it ago. I have to say, I'm glad I did. My littles loved this video. There was a good mix of jokes (for adults and kids) with good facts of the origins of the Christmas traditions. I also enjoyed the fact that everything wasn't all puppets. There were some cartoon sections put in for a couple of parts and it help break up the show into smaller sections for kids to understand. The segments offered some good insight into the history of the traditions and showed how everything was morphed into one giant celebration of Christmas from many smaller areas. The littles and I also watched the extra features. There were some fun sing-a-long songs, a poem of Christmas from Buck Denver that had me crack up a couple of times, and a blooper reel. Some kids can get a glimpse into the making of puppet show that way, which is great. This was a fun video and the littles has requested to watch again, so it is one I would recommend to anyone.